[Intro: Several weeks ago I completely disengaged from all community, stopped posting on my blog, and deactivated my Facebook and Twitter accounts. I did not attend my graduation from the PIHOP SSM and Fuller Theological Seminary. Unbeknownst to all but a handful of close friends I have spent 90% of my time alone in my room with the door shut as I have been in a deep depression. In the next three posts I’ll try to explain why this happened as a result of a one-two punch that came from dealing with life on life’s terms and where I am at now. My entire life I have been a knight-errant on a valiant quest for…something. I have always felt a void that I could never explain or describe but knew I needed to fill with an equally mysterious something. Like a clueless Prince Valiant I set off and this blind but passionate pursuit has been the driving motivation behind my life. This journey kicked into high gear in 2008 after I had an eye surgery to correct glaucoma. Right before I went under for surgery I was faced with the fact that I was raging pissed, I was completely miserable, and I was hiding it from everyone. I decided I needed to stop pretending everything was fine, I needed to get honest with myself and other people and I needed to make some changes in my life. While I knew these changes would come at a price and that a new level of self-awareness might reveal some truth not to my liking, I believed that all things considered it would certainly be worth the cost. At the very least anything had to be better than where I was at. As I continued on this journey I have given myself completely to a variety of people places and things, hoping that they were or would provide this something I needed to fill this void I did not understand. However, as I have gotten older, as I have tried more and more things, as they have all failed to be that something I’m looking for, I have realized this is an ongoing pattern in my life that is closely tied to my cycles of depression. In the last couple weeks, in exploring this dynamic in a new counseling relationship, I have finally become able to name the void that I have been trying to fill. What I have been on a quest for, what I have been intuitively and instinctively attempting pursuing, is the love of my family that I was denied as a child and to change in me what was broken as a result of not receiving that love. My parents did the best they could and provided for my educational and material needs exceptionally well. However, when it came to providing for my emotional needs, I was often neglected or even abused. This deeply impacted me and the character defects that I hate the most about myself all appear to trace back to the problems in my family. In other words, I have been trying to have the experience of growing up in a loving and stable home and to fix what was broken because I grew up in a home that was not. All of my efforts to receive this love ultimately channeled into two streams. First, I hoped to be good enough in order force change in my family, so that I would experience a loving a and healthy family now and that would somehow makeup for my past. Second, I hoped to by get married and start my own family, so that I by creating this experience in my own family that would somehow makeup for my past. Like Scott Bakula in Quantum Leap I have been trying to “Set things right that once went wrong,” only without any way to travel back in time or any holographic and omniscient guides like Al or Ziggy. In the last couple weeks I have also been faced with the reality that I will never be able to fill that void. I see now that the time to have received the love I missed as a child, the love that I have so desperately sought, has come and gone. None of the solutions I have pursued have worked because none of them can. The experience of growing up in a loving and stable home environment has been forever denied to me. Nothing can fix or change that and nothing ever will. The only way forward is to acknowledge the unchangeable nature of this loss, mourn it and move on. In a similar vein, the character defects that I hate most in me are not going away. I have been searching for some categorical change, some permanent deliverance from these things, and have even been willing to work incredibly hard for it, but such a change is not going to come. The best I can hope for is incremental change over a very long period of time. So the same week I was finally able to name what I have been searching for my entire life was the same week I was faced with the fact that I am never going to get it, no matter how hard I try, no matter what I do, no matter how unjust the situation feels or is. This is not where I thought my pursuit of truth and healing was going to lead me. I thought my journey of self-discovery and in all of these healing paths would lead to change and fulfillment. I believed that all of my hard work in recovery and healing, all of my efforts to be a good man, all of my attempts to obey God would lead to a happy life and control over my past, my family and my character defects. I realize now that the journey before me, the journey that has always been before me, is to accept my past and mourn it, it is to accept who I am make peace with myself, and attempt to cobble together enough meaning to believe I have a life worth living. I feel like Don Quixote who, in a moment of uncharacteristic clarity and self-awareness, has finally seen the truth that what he perceived as noble and gallant endeavors were actually pathetic, pitiful and futile attempts to turn the clock back, change what cannot be changed, and gain control over what cannot be controlled. 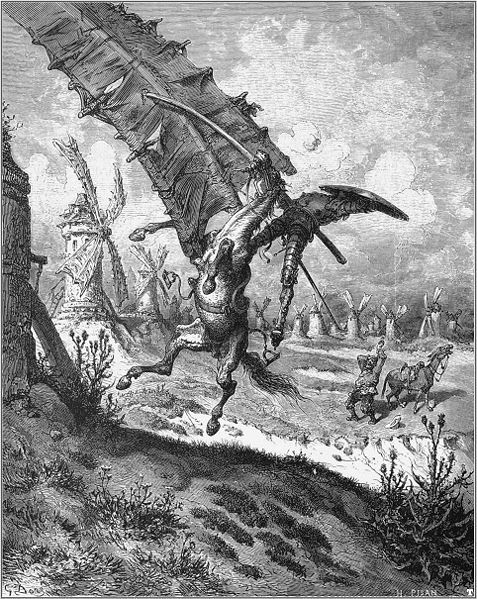 I see now that, to one degree or another, all of my endeavors and hard work have been tilting at windmills. A chasing after the wind. Faced with such clarity I have been forced to give up the mad quest that has driven my life forward. Like this hypothetically self-aware Don Quixote, I have had to quit my quest and hang up my spurs. This is the bitter culmination of the journey I set in motion in 2007. This is the high cost of truth, enlightenment and self-awareness. Part of me wishes I had just stayed in denial. This entry was posted in Personal Commentary and tagged childhood trauma, depression, disillusionment, mourning childhood trauma, suicide. Bookmark the permalink.